Available only on Rosemond.com. This is the BIG ONE! Children depend on parents for the two L-words of Love and Leadership. In today’s parenting culture, Love is often weakened by well-intentioned enabling, and Leadership is weakened by the equally well-intentioned attempt to be “popular” with one’s children. 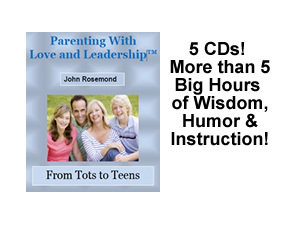 In this entertaining and thought-provoking series of talks, John tells parents how to deliver these two essential parenting ingredients in ways that strengthen children emotionally and help them grow into responsible, compassionate citizens.